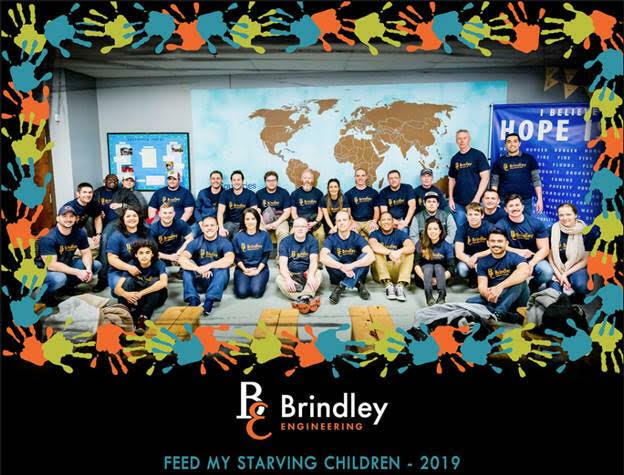 LISLE, IL March 20, 2019 — Today, Brindley Engineering, one of Chicago’s world-class engineering firms in capital & maintenance projects, reliability initiatives, and construction solutions celebrated a successful 2018 with a company-wide visit to a local charity, Feed My Starving Children (FMSC), in Aurora, Illinois. The company sets annual performance goals (or “KPIs”) around growth, talent acquisition, retention, customer outcomes, social responsibility, awards & publications, customer diversity, and more. All 2018 goals were exceeded so the company celebrated by giving back. FMSC is a nonprofit dedicated to providing nutritious meals to children worldwide. The Brindley Engineering staff packed 236 boxes of dried food, equaling 50,112 meals, or enough to feed 137 kids for an entire year. This event is one example of Brindley Engineering’s dedication to corporate social responsibility. In 2019 so far, the company has also raised money for the Lurie Children’s Hospital and for the Muscular Dystrophy Association at a charity bowling event sponsored by a local client. The total raised at the event was over $100,000. Feed My Starving Children (FMSC) is a Christian nonprofit dedicated to providing nutritious meals to children worldwide. FMSC meals are hand-packed by volunteers and sent to an incredible network of partner organizations who distribute them to those in need. Nearly 1.2 million volunteers packed more than 333 million FMSC meals in 2017. More than 90 percent of total donations go directly to feed kids. To learn more, visit www.fmsc.org. Headquartered in Lisle, IL, Brindley Engineering was founded by President Tom Brindley, P.E., in 2004. After years in the field, Brindley saw a growing need to improve reliability and decrease overall infrastructure life cycle costs. Brindley Engineering analyzes, designs and advises on the challenges of aging, mission-critical infrastructure, for capital and maintenance projects, as well reliability initiatives and construction solutions. Brindley Engineering services clients in a variety of industries including Oil & Gas Extraction and Pre-Processing (Upstream), Pipelines and Terminals (Midstream), Petroleum Refining (Downstream), Gas Processing, Chemical Plants, Steel Mills, Petrochemical Plants, Power Plants, Pharmaceutical, Manufacturing, Water Treatment. To learn more, visit brindleyengineering.com. 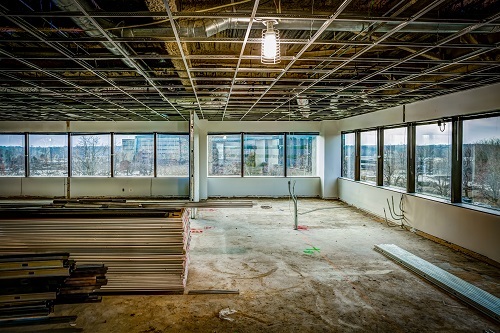 Build-out reflects customized work space to meet needs of growing workforce with strong emphasis on unique collaboration space. 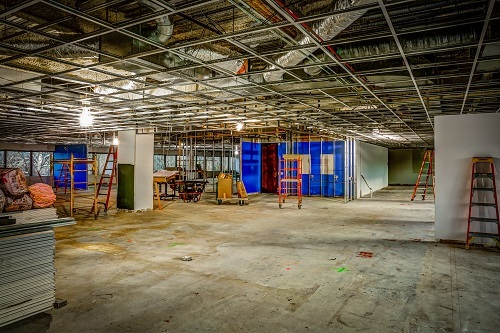 LISLE, IL March 4, 2019 — Today, Brindley Engineering, one of Chicago’s world-class engineering firms in capital & maintenance projects, reliability initiatives, and construction solutions, announces construction build-out for expanded headquarter office located at 901 Warrenville Road in Lisle, Illinois. This is another milestone for the growth story of Brindley Engineering, an innovative, tech-forward, engineering firm founded with a vision to provide the highest level of service to clients in capital and maintenance projects, reliability initiatives, and construction solutions. The build-out includes an open-office plan with ample natural light, sit-stand desks, high-end central conferencing facilities for collaboration, and varied work environments to support a healthy, engaging place to work. Modern finishes will be incorporated throughout the office space, including branded wall graphics, modernized lighting, custom millwork, and flooring. The office is located close to Morton Arboretum in close proximity to the downtown Lisle train-station. There is an in-building fitness center with locker rooms, in-building cafeteria, and beautifully maintained grounds. Dan Ryan, project manager for Brindley Engineering, will lead the construction team on behalf of the firm with Ostrander Construction serving as project superintendent. Ware Malcomb will provide the architectural services. Headquartered in Lisle, IL, Brindley Engineering was founded by President Tom Brindley, P.E., in 2004. After years in the field, Brindley saw a growing need to improve reliability and decrease overall infrastructure life cycle costs. Brindley Engineering focuses on asset evaluations and efficient repairs rather than costly and time-consuming replacement of infrastructure. Brindley Engineering services clients in a variety of industries including Oil & Gas Extraction and Pre-Processing (Upstream), Pipelines and Terminals (Midstream), Petroleum Refining (Downstream), Gas Processing, Chemical Plants, Steel Mills, Petrochemical Plants, Power Plants, Pharmaceutical, Manufacturing, Water Treatment. Long time industry leader to develop Brindley Instrumentation and Controls team, liaison with clients for all growth initiatives. LISLE, IL November 28, 2018 — Today, Brindley Engineering, one of Chicago’s world-class engineering firms in maintenance, reliability and constructability, announced the addition of Ms. Mina Imani to its team. This is another milestone for the growth story of Brindley Engineering, an innovative, tech-forward, engineering firm founded with a vision to provide the highest level of service to clients in the maintenance, reliability, and constructability areas. Imani is an Instrumentation and Controls leader who has spent 16 years working for Oil and Gas consulting companies, small and large size in Canada and Middle East. Imani joins Brindley Engineering most recently from Alberta, Canada where she worked at Canadian firm, Bantrel, specializing in engineering, procurement and construction management services to upstream and refining plants. Imani joins Brindley as an Instrumentation Engineer, who will be making a major impact in this specialized department of Brindley Engineering. Over the past 12 months, Brindley Engineering has added to its client-roster ExxonMobil Joliet, the CITGO refineries in Lake Charles, LA, Corpus Christi, TX, and Aruba; Graycor Inc., Praxair, and others. Imani has a degree in electrical engineering from Khajeh Nasir Toosi University in Iran. She lives in Naperville with her husband and daughter. In March 2019, Brindley Engineering will be attending the American Concrete Institute (ACI) Semi-Annual Convention in Quebec City, Canada. ACI Conventions are excellent opportunities to learn about concrete and to meet professionals passionate about this exciting material! At the convention, Brindley Engineering will be participating in committee meetings for 546D (Packaged Repair Materials) and 546 (Repair of Concrete), of which Nicholas Triandafilou, P.E., S.E. has been a member since 2016. Brindley Engineering is looking forward to catching up with old colleagues, making progress on concrete repair publications, attending technical sessions, and meeting new concrete enthusiasts. Long time industry executive to lead Process Team initiatives for company’s long-term growth and scale. LISLE, IL November 13, 2018 — Today, Brindley Engineering, one of Chicago’s world-class engineering firms in maintenance, reliability and constructability, announced the addition of Gavin Palmer to its executive leadership team as Process Team Lead. This is another milestone for the growth story of Brindley Engineering, an innovative, tech-forward, engineering firm founded with a vision to provide the highest level of service to clients in the maintenance, reliability, and constructability arenas. Palmer is an industry veteran in Technical Process leadership on small, mid and large capital projects in the refining, energy and chemical industries. He will be responsible for directing and building out the Brindley Engineering Process department infrastructure, serving client needs for small, mid and large capital work in refining and other industries. Palmer’s strategy includes an emphasis on the recruitment and mentorship of top young Process Engineering talent, with a focus on the development of their careers. This hire comes at a time when the industry is growing, and engineering resources are at a premium. Palmer joins Brindley Engineering most recently from Ambitech. Previous to Ambitech, Palmer worked at Stepan Company, leading teams of operators in the day-to-day operation of site utilities. Palmer has held Process Engineering roles of increasing responsibility for nearly 20 years. Palmer has a master’s in chemical engineering from Loughborough University in England. He lives in Mokena with his wife and 4 children. Long time industry executive to lead talent acquisition and human resources initiatives for company’s long-term growth and scale. LISLE, IL November 2, 2018 — Today, Brindley Engineering, one of Chicago’s world-class engineering firms in maintenance, reliability and constructability, announced the addition of Mark Manalad to its management team. This is another milestone for the growth story of Brindley Engineering, an innovative, tech-forward, engineering firm founded with a vision to provide the highest level of service to clients in the maintenance, reliability, and constructability areas. Manalad is a seasoned recruiting and human resources leader whose career spans two decades of work in the engineering sector. Manalad joins Brindley Engineering most recently from Ambitech. Previous to Ambitech, Manalad worked in both staffing agencies and well-known engineering consulting firms as well as operated his own boutique search firm. Manalad joins Brindley as a Manager of Talent Acquisition and Human Resources who will be making a major impact in the growth and culture of Brindley Engineering. Over the past 12 months, Brindley Engineering has added to its client-roster ExxonMobil Joliet, the CITGO refineries in Lake Charles, LA, Corpus Christi, TX, and Aruba; Graycor Inc., Praxair, and others. Manalad has a BS in Psychology from the University of Illinois at Chicago. He lives in Oswego with his wife and daughter. Come see the Brindley Team present at the ASCE Forensic Engineering 8th Congress Conference in Austin, Texas that occurs between November 29th through December 2, 2018 at the Sheraton Austin Hotel at the Capital located at 701 E. 111th Street in Austin, TX. Silver Sponsors: Element Analytical, PLLC; Nelson Forensics; Simpson Gumpertz &Heger Engineering of Structures and Building Enclosures; Wiss, Janney, Elstner Associates, Inc.
company’s long-term growth and scale. LISLE, IL September 18, 2018 — Today, Brindley Engineering, one of Chicago’s world-class engineering firms in maintenance, reliability and constructability, announced the addition of Bernie Gunn to its executive leadership team. This is the next chapter of the growth story for Brindley Engineering, an innovative, tech-forward, engineering firm founded with a vision to provide the highest level of service to clients in the maintenance, reliability, and constructability areas. Gunn is a seasoned leader whose career spans three decades of client and employee-development positions and has led some of the highest-performing engineering teams across a multitude of disciplines. Gunn joins Brindley Engineering from Ambitech and Zachry Engineering groups, where he spent over 20 years and held leadership positions as Vice-President of Engineering and Vice-President of Major Projects. Gunn joins Brindley as a Principal who will be leading business development as well as overseeing operational execution strategy to help Brindley Engineering continue to scale and provide the best client service in the industry. Over the past 12 months, Brindley Engineering has added to its client-roster ExxonMobil Joliet, the CITGO refineries in Lake Charles, LA, Corpus Christi, TX, and Aruba; Graycor Inc., Praxair, and others. Copyright © 2018 Brindley Engineering Corporation. All Rights Reserved.